With all of the hustle in our busy lives, finding the time to make a simple roasted chicken can be difficult. Happily, an easy way to cut down cooking time exists: butterflying. By removing the backbone from the chicken and splaying it out flat, it cooks much faster — it also helps that it can be cooked at a much higher temperature, which happily results in crisp, browned skin without drying the meat due to the shortened oven time. I find carving a butterflied chicken to be much easier as well. You’ll need a sturdy pair of kitchen shears — preferably ones that can be taken apart for thorough washing — and some earplugs if you’re squeamish, the crackling sound of cutting through bone is too much for some to handle. If it’s any consolation, it’s over quickly. Along with the backbone, I remove the wing tips which then I squirrel away in the freezer with any other boney parts included in the giblet pack (usually a neck) for stock. I paid for the parts, might as well use ’em! If you plan a few days ahead of time, you may also sprinkle the butterflied bird with about one tablespoon of Kosher salt per pound. Store in a tightly sealed bag in the fridge for one to two days, rinse and dry very well, then roast (no need to coat with oil or more salt). The skin gets extra crisp and salty with this preparation method — I refer to it as a chicken chip, kind of like a chicken chicharrón, there’s never enough to go around — and the meat becomes much more firm, flavorful and forgiving to overcooking. Dry brining for the win! Paired with a starchy side (I love it with risotto, but I’m a rice > potatoes kinda girl) and a vegetable, it becomes the centerpiece of a well-rounded meal. For the leftovers, I suggest making chicken salad-stuffed tomatoes, Pasta Bravo! or a whole number of other recipes. Farewell rotisserie chickens of questionable freshness! There’s been a lot of talk recently about whether or not you should rinse meat before cooking it. When I butterfly chickens, I always do — without fail there are a few small pieces of bone that are best rinsed away prior to cooking. I just make sure that I clean up very well and then sanitize the surfaces that have come into contact with the raw chicken. My favorite non-bleach sanitizer is the Disinfectant Spray by Seventh Generation, once the surface is clean it gets sprayed on and left to do its thing for 10 minutes — the thyme scent goes nicely with that of roasting chicken, to boot! Line a small, rimmed sheet pan with aluminum foil, place several layers of paper towel on top. 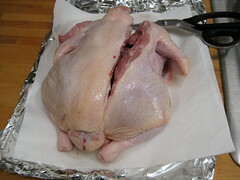 Remove giblets from the cavity of the chicken; rinse, dry and reserve for another use. Place chicken, breast up, on paper towel-lined pan. Using kitchen shears, snip off the wing tips (do not remove flat or drumette); rinse, dry and reserve for another use. Flip chicken over so the backbone is up. Using kitchen shears, cut from bottom to top along the right side (left if you’re left handed) of the backbone. 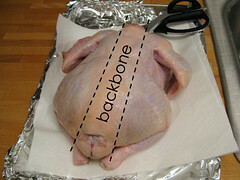 Rotate bird 180°, and once again cut from bottom to top along the right side of the backbone. Snip backbone in half, rinse well to remove any bone fragments, dry and reserve for another use. Rinse bird very well to remove any bone fragments and icky bits (technical term). Dry with paper towels as best you can. 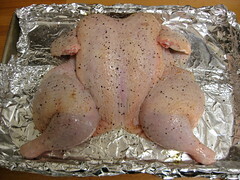 Change paper towels on sheet pan, and set bird atop, breast side up with legs to either side. 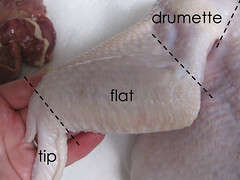 Place your hands on the breastbone and press down hard to flatten as much as possible (as though you’re giving the bird CPR, albeit a very violent version). For best results, allow chicken to dry for at least 30 minutes while the oven preheats (if you’re pressed for time, feel free to preheat oven ahead of time and proceed to the next step now). Preheat oven to 475° – 500°F. Remove paper towels from sheet pan, set bird directly on top of aluminum foil lining. Drizzle about 1 teaspoon olive oil over bird, rub it into the skin to coat evenly. Sprinkle with about 1 teaspoon Kosher salt and 1/4 teaspoon black pepper. 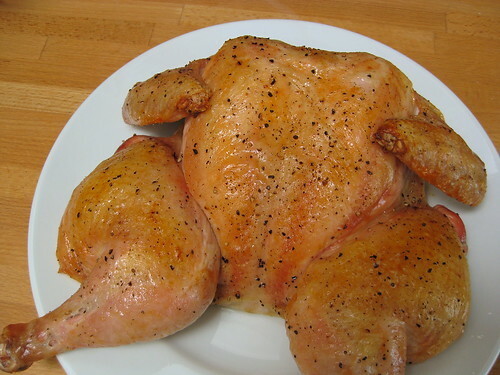 Place in oven and roast for about 40 – 45 minutes, or until chicken is cooked through (165°F). 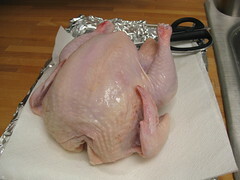 Remove from oven, loosely tent with aluminum foil and allow to rest for 15 minutes before carving.